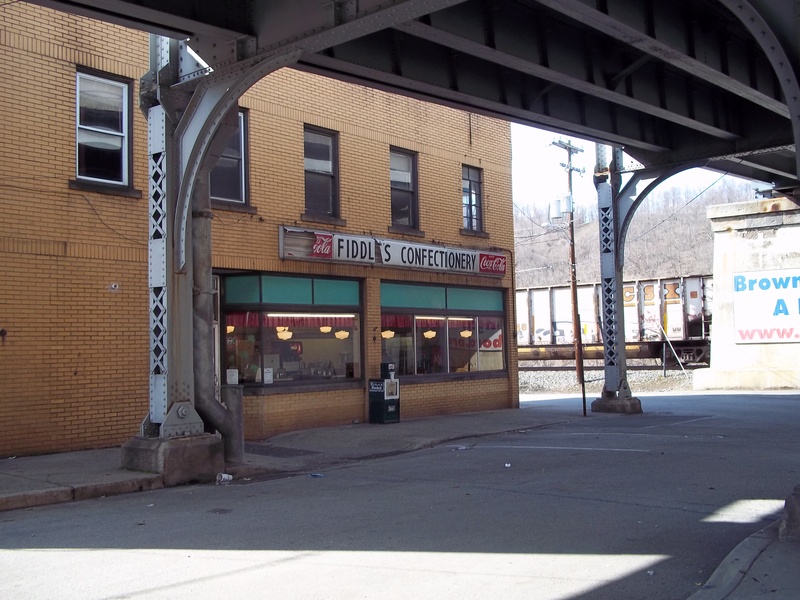 Mile 75 – Fiddle’s Confectionery, Brownsville, Pa.
Fiddle's Confectionery on Bridge Street in Brownsville, Pa., located under the Intercounty Bridge. During my time in Brownsville, I struggled to find an older, historic eatery that was not part of a chain. I drove what seemed like all over town looking for a place that is local, along (or near) the National Road and has a significant historic connection. Fiddle’s isn’t actually a confectionery in the literal definition of the word. Instead, it is a full-service restaurant with a significant emphasis on an American favorite – hot dogs. For myself, I had the chili dogs, which were made up of a toasted bun, a hot dog split open down the middle and then loaded with chili. Of course, Fiddle’s does have many other options besides hot dogs, especially breakfast food. What makes Fiddle’s special is the attachment the restaurant has to the community. Fiddle’s has been in operation since 1910, and although owners have changed, Fiddle’s is one of those restaurants that has retained a similar atmosphere throughout its existence. The booths along the front window of the dining area have been in use in the 1920s, and a dining counter is also still in use (though the arrangement of the restaurant has been moved around since the 1960s). 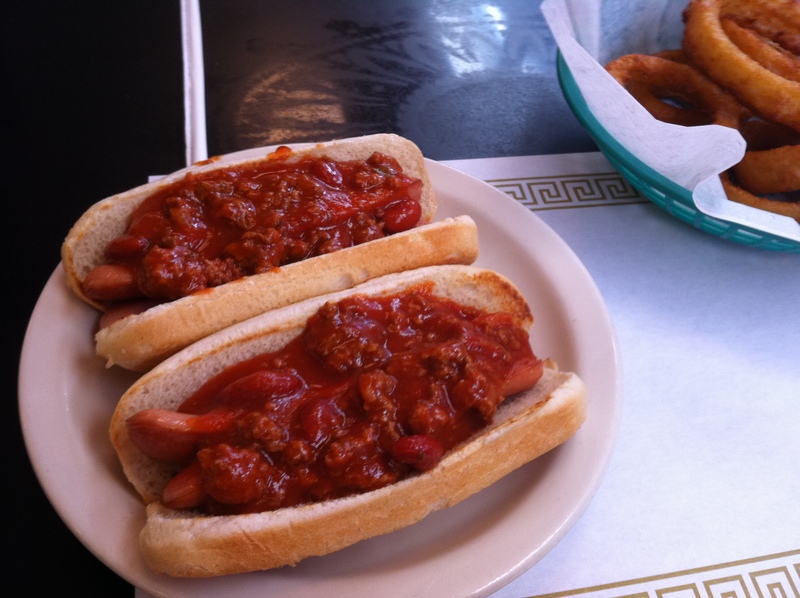 Chili Dogs at Fiddle's Confectionery, Brownsville, Pa. In addition to the restaurant’s literal history, there’s something to be said about a community business that has weathered the ups and downs of the economy, and still operates despite the business’s home town losing roughly two-thirds of its population since the early 1900s. When I stopped by on a Friday afternoon, there were only three other patrons in the whole place, all of whom were older men who fit the stereotype of a former blue-collar worker in a Rust Belt town (though this doesn’t mean the crowd is the same all the time!). Even the location of Fiddle’s speaks for itself, as the restaurant is more or less under a bridge built after the restaurant’s home, and is smack in the middle of a town (and a region) with too many buildings and not enough tenants. That being said, the simple existence of Fiddle’s, plus the great taste of the food, makes the restaurant a great stop along the National Road, if for nothing else than to get a nostalgic taste of a bygone time. To get to Fiddle’s (101 Bridge St.) – which can be confusing for out-of-towners – turn on to Water Street from Market Street, which is one block east of the Intercounty Bridge (see the map). Follow Water Street around a left curve, and Fiddle’s will be directly in front of you. Parking is available under the bridge by turning left upon reaching Fiddle’s. To contact Fiddle’s by phone, call 724-785-2020. It’s also important to mention that debit and credit cards are not accepted. However, there is an ATM inside. Fiddle’s is open all week; 7 a.m. to 3 p.m. Monday through Saturday, and 7 a.m. to 2 p.m. on Sunday. This entry was posted on Wednesday, April 4th, 2012 at 15:46	and tagged with brownsville, diner, fiddles, hot dogs, national road, pennsylvania and posted in Brownsville, Dining, Fayette County, Pennsylvania, Uncategorized. You can follow any responses to this entry through the RSS 2.0 feed. « Mile 75 – Brownsville Heritage Center, Brownsville, Pa.